When most of us think of New Mexico as the “Land of Enchantment,” we think of its lovely desert scenery, adobe communities, and Rocky Mountain playgrounds, but the enchantment in New Mexico is not only about its beauty. While New Mexico boasts some of the most magical vistas in the country, the enchantment there goes somewhat deeper. New Mexico is a state steeped in tradition. One might even say it is a place in which time stood still. In fact, many might say it is largely unchanged from the time when Buffalo Bill and Davy Crockett were regulars at the local bars in 1876. Now, over a century later, the people of New Mexico still carry guns without a permit almost anywhere. The geothermal mineral waters of the Ojo Caliente that flow from the ancient volcanic aquifers have served as a tonic for aching bodies for thousands of years, and the people of Roswell have been reporting UFO sightings with frightening regularity. Sound interesting? 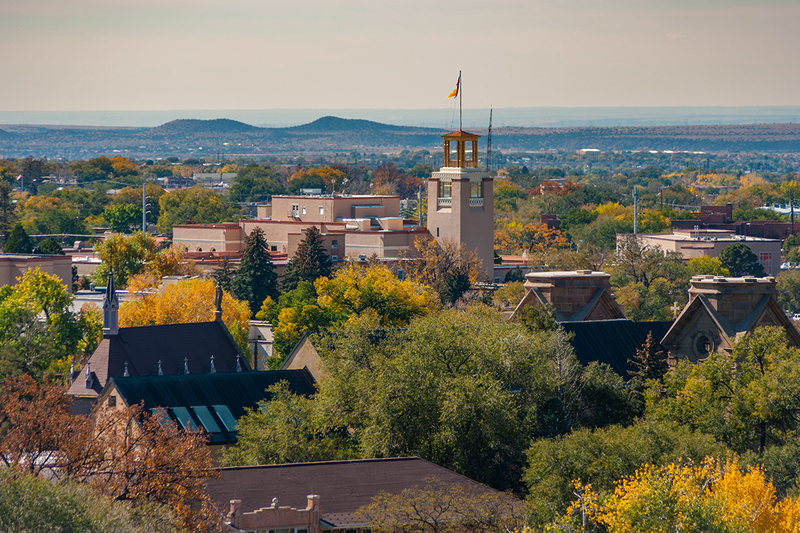 The highest state capital, Santa Fe, sits 7,000 feet above sea level, and its charming quirkiness only begins there. Santa Fe is eerily reminiscent of the Wild West. The Palace of Governors in the downtown plaza was built over 300 years ago in 1610, and it still hasn’t let go of its youth. Visitors will find more than a touch of the Annie Oakley days in the walls of this historical palace. Also known as the “City of Faith,” Santa Fe has seen more than its share of miracles. Speaking of which, the Loretto Chapel was said to have been built in 1879 by a man who “just showed up” with a donkey and toolbox. The staircase has no visible support, two 360 degree turns, and wooden pegs instead of nails. It might be a miracle if you don’t fall down it. Locals say the unidentified handyman was St. Joseph himself. If you’re making your bucket list of places to go, be sure the put Carlsbad Canyon on it. Filled with ancient sea ledges, flowering cactus, and desert wildlife, the canyons may lie resplendent across the Chihuahuan Desert, but the real marvels lie beneath the surface. Under the canyons are over 119 caves formed when sulfuric acid dissolved the limestone rock, leaving behind stalactite-filled caverns of all sizes. If you’ve got some vampire blood, come in late May to watch the “Bat Flight Program,” when bats return from migration. It’s bloody wonderful! Another of New Mexico’s enchantments is the White Sands National Monument. Rising from the Tuscaloosa Basin, the White Sands is one of the great natural wonders of the world. Its gypsum dunes cover over 125 acres of desert, making it the largest gypsum dunefield in the world, and the home to some of the most unusual critters. Apparently, it’s not too easy to survive in this harsh environment, and the over 800 creatures who live there have developed some pretty novel survival strategies. Most of the animals are nocturnal, so you may want to take along a flashlight to shed some light on things. Our Lavelier stores are located in Santa Fe. When you’re done reading up on the miracles of Loretto Chapel and the incredible survival strategies of the White Sands gypsum dunes, you may want a miracle of your very own. Drop by one of our Lavelier stores for free product demonstrations and miraculously invigorating skincare; our skincare specialists will also be able to guide you on the best skincare for your skin type.